What is 3H family culture ? Work together & help each other to bring best healthy practices and happiness into family culture. Cook together and eat together, share food to others before you eat. Serve together to mother nature & other beings. It is important to live with consciousness. as you aware these days everything became unsafe. Air, water, food etc. people forgotten the originality of life on earth. Now it is time to bring the right awareness without getting cheated by out side world.. specifically about: it is not about what you like or what you don’t like, it is about what is good for you and good for all. 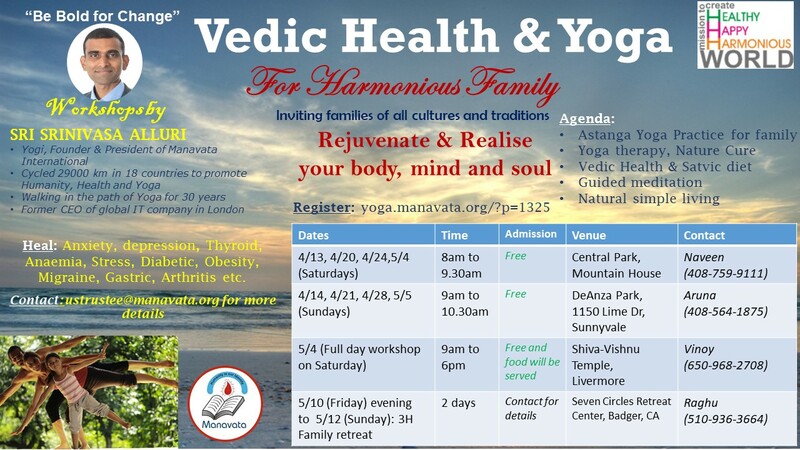 Yogic and Vedic health techniques to make whole life & family Healthy, Happy and Harmonious. Unique opportunity to experience blissful self and recharge yourself! Right Food, purpose and aim of life, Eco-friendly living. Be Aware! Live with consciousness!